Using iCloud as Key/Value storage is almost identical to NSUserDefaults, except it populates to iCloud in the background and can be read from any device on the same account. What I find much harder than the code is how to make this work in Xcode. But of course, simply adding the code would be way too easy. We also need to let the Apple servers know that we want an App ID to save some data, for which we need a Provisioning Profile. Let’s create both next. 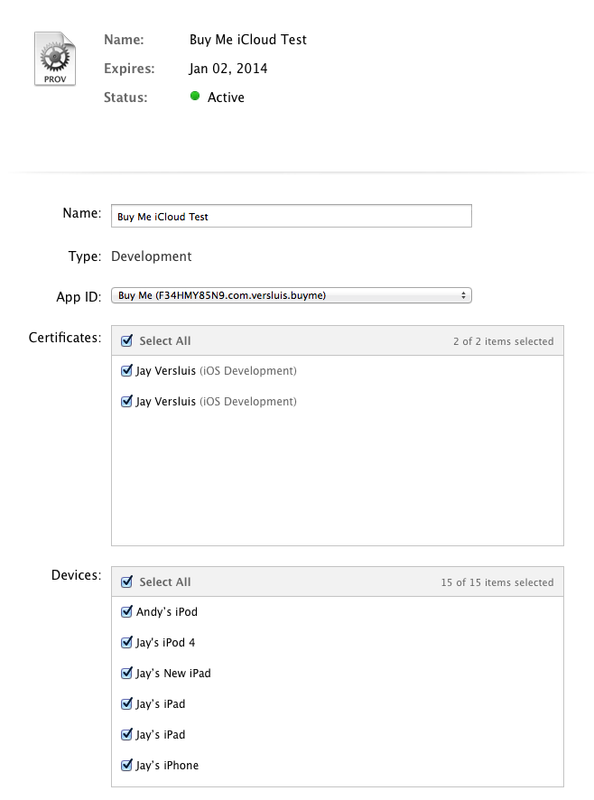 Head over to https://developer.apple.com/account/overview.action and under iOS Apps click on Identifiers Note you’ll need to login with your developer credentials. You’ll see a list of existing App ID’s. Create a new one by clicking on the little PLUS icon in the top left corner, or click on an existing one to edit it. We’ll need to enable “iCloud” on our particular App ID. 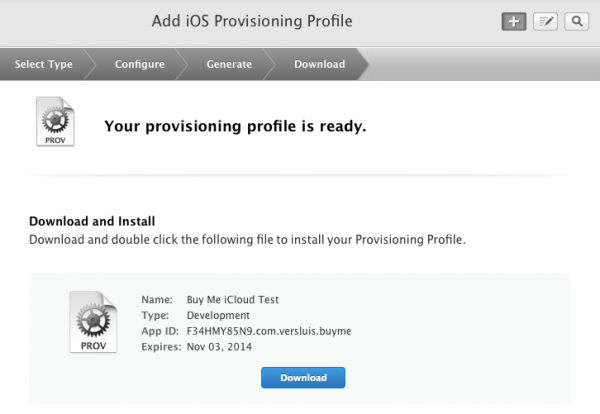 Once the App ID knows it has iCloud enabled, we need to create a new Provisioning Profile for it. On the left hand side, under Provisioning Profiles, click on Development and either edit an existing one or create a new one for your App ID. Obviously an existing profile needs to be associated with our App ID, be that existing or new. A handy drop-down menu will help you out. You must now download the profile and then simply double-click it in Finder (or the Safari download list) to import it into Xcode (4 and 5). In Xcode 4.6.3 you can verify that this has happened by opening the Organizer window, then under Library click Provisioning Profiles. You should see your new profile in here. There’s also a convenient refresh button which I believe downloads and installs new and updated profiles at the touch of a button. In Xcode 5 the section for refreshing amended profiles has moved to Xcode – Preferences – Accounts. 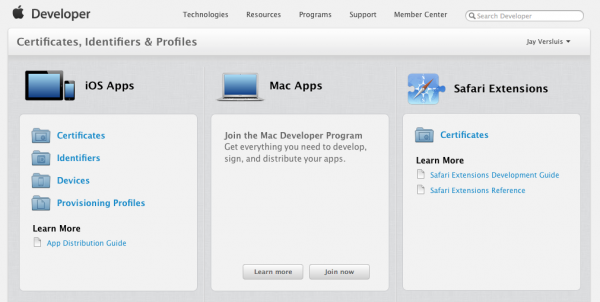 In here, select your Apple ID and hit View Details. This will list all signing identities and Provisioning Profiles. You have the option to add more identities, or refresh existing profiles. 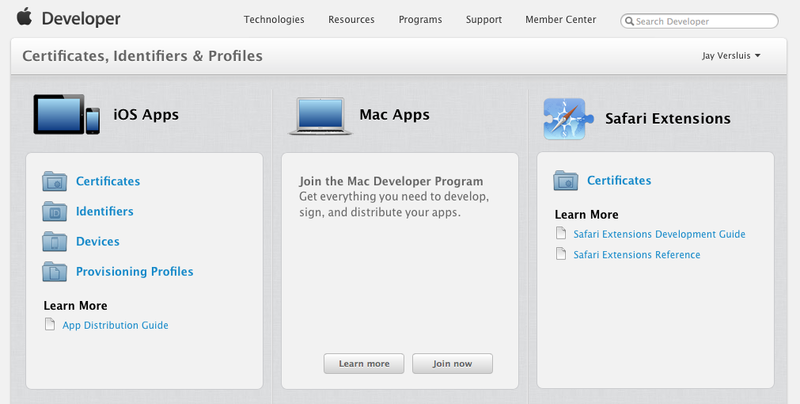 You can also head over to Editor – Provisioning Profiles – Import if you’d like to add a profile manually. 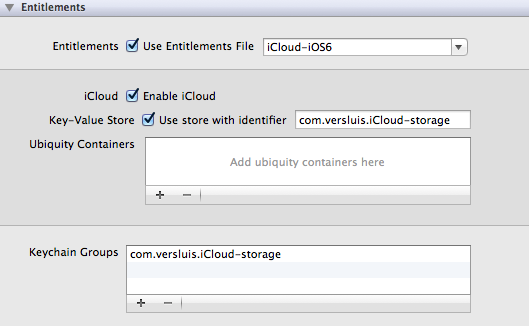 In Xcode 4.6.3 you need to head over to your target and in the Entitlements section, tick the Entitlements box. This will generate a .entitlements file in Xcode that you won’t have to worry about. Underneath it check the “Use iCloud” box, as well as the “Use Key/Value Store” box. Xcode will also want to know which store identifier you want to use. In our example it’ll match the App ID’s reverse domain Bundle Identifier, but I understand that it can be something else, so that two apps with different identifiers can share the same data. I haven’t tried this though, so don’t quote me on it. Build your project, and if no spurious error messages are coming up your App is ready for iCloud! Remember that iCloud only works on real devices, NOT on the simulator. You’ll need two devices to see if this works. One common problem is that a device is not ticked in the Provisioning Profile, in which case Xcode will throw an error when you try to deploy your app. Just something to bear in mind. // setup iCloud "user defaults"